FAIR is one of the only shops in the country to specialise in Fair Trade and ethical fashion. Located in the city of Brighton and Hove, we opened our doors in 2008 to offer the residents of Brighton and Hove beautiful, fair trade products from around the world. We are located at fashion landmark 21 Queen’s Road which was home to Brighton Biba in the 1960s. At FAIR we stock a range of different brands whose ethical credentials are second to none, not only in their support for Fair Trade production but increasingly through the use of organic and sustainable fabrics. We have a fabulous range of womenswear and childrenswear and a developing selection of menswear as well as products for your home. So why Fair Trade? For us at FAIR, it’s a completely different way of doing business that ensures people and the planet get the respect that they deserve. Awareness of the social and environmental costs of “fast fashion” has grown tremendously in the last few years and consumers are increasingly seeking out alternatives. We are here to offer those alternatives and show consumers that there is another way. Since 2008, FAIR has been nominated for a number of local and national ethical fashion awards. Most recently, FAIR has been nominated in the category of Best Independent Boutique for the Ethical Fashion Forum’s 2012 Source Awards. This award recognizes best practice in the curation, marketing and sale of sustainable fashion through a multi brand platform. 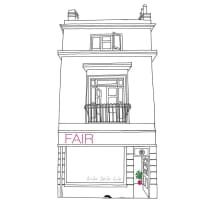 At FAIR we lovingly select beautiful, individual, quality items for you, your wardrobe, your family and your home to show that Fair Trade and ethical fashion and household goods are stylish, functional and affordable. Of course, our producers are at the heart of what we do. We support organisations working hard to generate a livelihood through the use of traditional craft and skills by either purchasing their products or working with them to create new products perfect for the UK (and FAIR!). Any brands we stock must have strong ethical credentials including Fair Trade production and the use of environmentally friendly materials. Buying Fair Trade feels fantastic and we think everyone should be able to experience that.